The right shoe can totally make or break an outfit! Whenever I’m putting an outfit together I almost always start from the ground up. I select my shoes first and then work from there adding clothing and accessories. Today I’m teaming up with Marc Fisher LTD to share one of my favorite ankle boots for Fall, The Yale Bootie and to talk about their new #MAKEYOURMARC campaign. What I love most about these booties is the amazing quality and I love all the detail, but more importantly they’re so easy to get on and off (have you ever had a boot that takes two people to pull off of your foot?!). I’m loving their new #MAKEYOURMARC campaign! It’s all about celebrating and supporting women who are positively impacting our world. You can join in on the fun, too! For every post on Twitter or Instagram with the hashtag $1 will be donated to Karlie Kloss’ charity Kode With Karlie Project. Or you can purchase from select styles of Marc Fisher Footwear LTD here (including the Yale Bootie I’m wearing) and $20 per pair will be donated! You can also nominate yourself or someone that inspires you using this form to be awarded a grant to support their efforts. I can’t wait to see how you will make your ‘marc!’ Be sure to share and then follow along to be inspired by other real women around the world. Brought to you by Marc Fisher LTD. I love how well your booties tie together your whole look! The perfect everyday fall outfit! Great campaign! I love when brands make a positive impact and encourage people to make a difference. I also love the outfit, a basic look is ALWAYS a great idea! What an awesome and inspiring post, Rach! I love when a good cause and fashion collide :) Your look is super chic and I love your hair (I think I say that in nearly every post)! I hope your day is as beautiful as you! Such a simple look, but those shoes make the outfit! Gorgeous outfit, I love those boots. You look so great, Rachel! Love the jeans and the Valentino bag! Those booties are great. They’re perfection transition pieces for almost all seasons. I love these high waisted jeans! So cutely paired with a simple white tee! Always love a good black and white combo. What a great campaign!! Shoes do make such a difference in your look. Those booties look so versatile and comfortable. Lovely simplistic look today!! It showcases your bag and boots perfectly! And your hair looks so beautiful, especially in the first pic! Hi Rach, Been following your blog FOREVER. Today’s post is so great because a. I love Yale the school, so anything named Yale, I pretty much love, b. JUST last night my bf had to help me pull off my boots!!! hahaha. We laughed so hard. c. Starting from the shoe up is the best way to make the answer to “what should I wear today” easy! :) Great post. I really like the simple looks you’ve been doing lately. Very laid back and so SLC. Ugh, boots that take a team to get on and off is the WORST. These booties are adorable! Okay, I’m OBSESSED with these booties! Love the idea of the #makeyourmarc campaign, too! those booties are so perfect for fall! Those booties are adorable! So pretty! I’m such a big fan of simple booties, these look so comfy! What a great campaign! 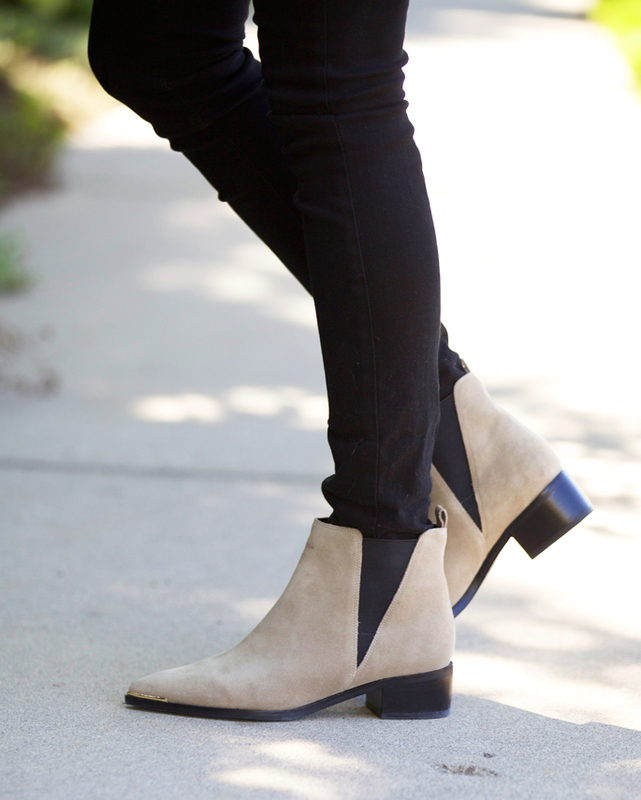 Love these booties on you-and all about navy bags! I LOVE this bootle! This outfit is perfect!! Love this look! The shoes are so cute! Very classic look comprising of wardrobe essentials! Cute boots and love the bag, beautiful piece! Looking so cute in this minimalistic outfit! These booties are absolutely gorgeous!!! I’ve been eyeing these boots in the burgundy suede! They look so much more expensive than they are and I love the do-good element! I really like the fit of those pants! Love your hair! Did you lighten it a bit?